Please tell me I’m not the only one who had no idea what Persimmons were till this year? Wikipedia tells me that they’ve been around for hundreds of years, but to me, it looks like they popped up all over the place just this year. Or I’ve just been living in a hole. But I’m glad they decided to make an entry. Because they are one of the sweetest fruits I’ve eaten. In addition to being gorgeous too. 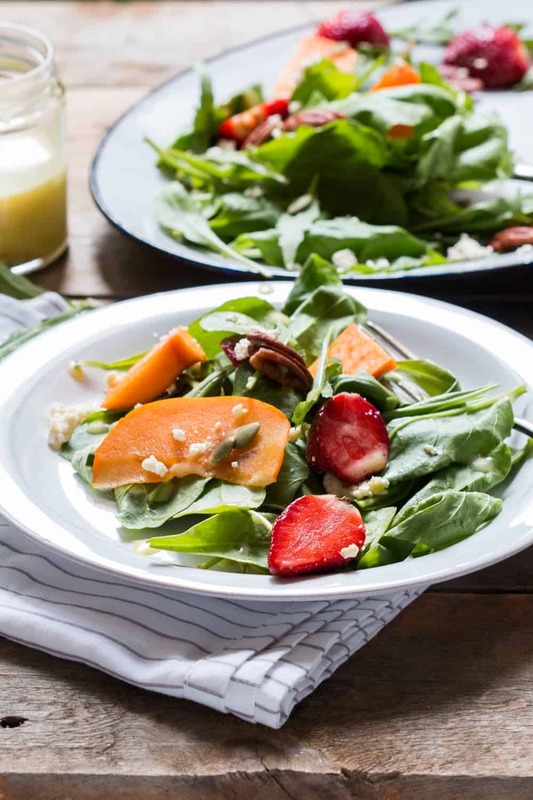 We’ve been buying them by the dozen, and this greens, persimmon ricotta salad drizzled with a burnt orange marmalade dressing truly celebrates them! 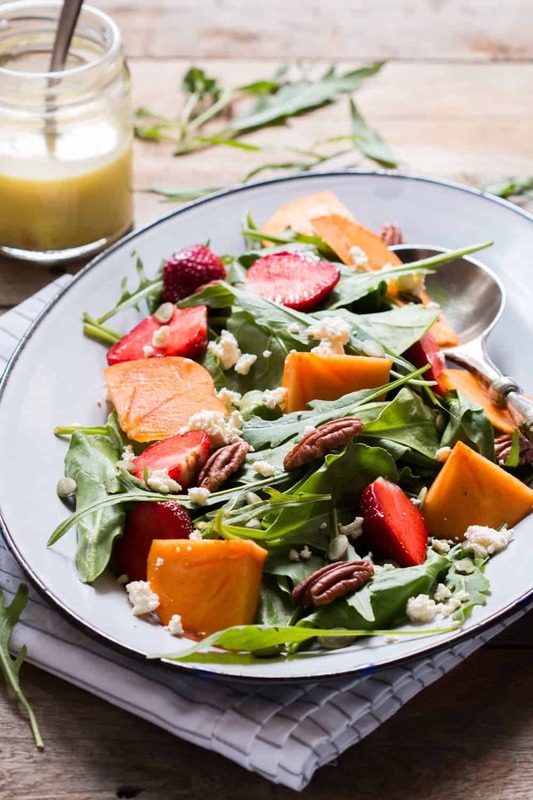 This salad is a true blue winter salad with lots of colors, lots of flavors and major satisfaction. 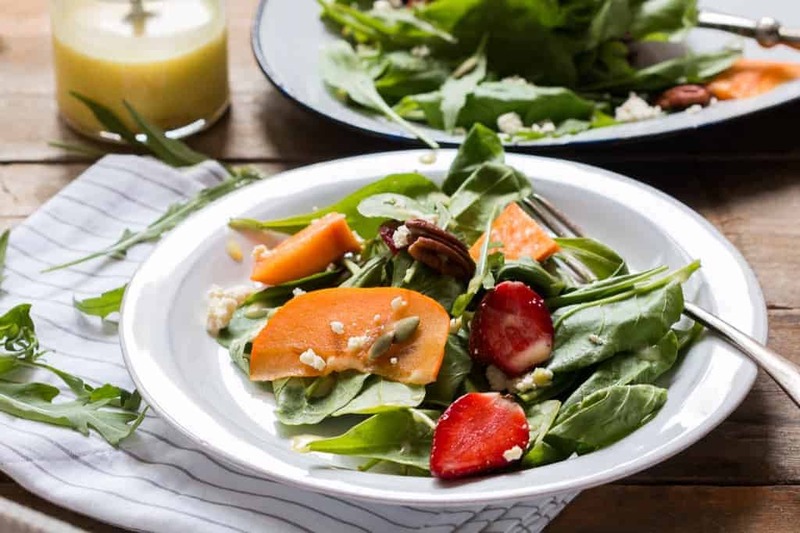 The persimmons and strawberries get together with baby spinach and arugula to give you a burst of sweet, spicy, sharp and bitter – all in one go. I also put together a fabulous bitter orange marmalade dressing which is sweet and tart to drown the salad in. Because when you taste that dressing, you will want to drown the salad in it! I know it’s bad practice but good salad dressings are my weakness. They can truly make or break a salad and this one’s topping the charts right now. When I’m talking about this salad, I can’t ignore the homemade ricotta. Homemade ricotta or the way I make it at home, is very close to paneer or cottage cheese, just milder, softer and creamier. And it’s perfect for this salad. With all those bold flavors, the ricotta adds some balance. It says, calm down everyone, and I like that. Salads should be bold so that every bite is a surprise. But you also need some semblance to that madness. And here, the ricotta does that for you. If I’m honest with you, we haven’t been eating too many salads these days. Because we just crave some hot curry all the time. It’s cold guys. And the tummy wants hot and spicy. But this salad goes with everything. Grilled Chicken and salad. Spicy fish and salad. Or just salad? I grew up eating persimmons in Brazil but never had it in a salad! Need to try this soon! I love them too Sara. Can’t get enough of them! YES, someone is using persimmons! I love these so great to see them in this gorgeous salad! Wow Nalini bua that’s another snippet of information. I had no idea they were called Ram Phal. I’ll send you my ricotta recipe, but do try this salad. Apart from looking beautiful, it’s also very refreshing! Thanks Nagi, that dressing is killer! Tamara it’s going to feature on our Christmas lunch this year as well. It’s such a colourful salad that I’m sure everyone will be reaching for a serving! Persimmons are really common in Japan which is where I first saw them. They are called Khaki there. I used to think the square shape was artificially induced till I saw them growing on trees. In India they are called Ram Phal! I buy them from INA market in Delhi. This salad seems like a meal on its own! Now I need your ricotta recipe. Gosh thats a pretty salad. 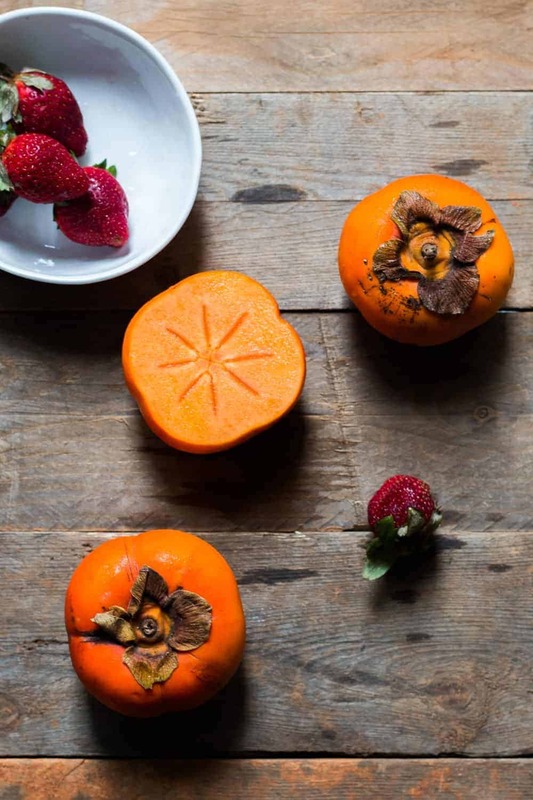 I’m dying to try persimmons…. 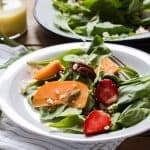 I must admit that persimmons aren’t my fave but I can see how it would be great in a salad! And that dressing? Fantastic!!! I’ve never prepared persimmons though my mother-in-law has for the 35 years I’ve been married. I love them! I’m a big fan of unusual salads, and this would be a beautiful addition to our Christmas table!